Following last weekend’s nightmare scenario for quality at the movies, things step up a little with the two new releases out this Friday. But then they’d have to, wouldn’t they? Universal is in “try, try again” mode as far as creating an animated hit, after the (relative) failures of Curious George, The Tale of Despereaux and 9 over the last few years, hitting the theaters with its most promising offering yet, Despicable Me. Steve Carell plays a not-at-all-Dr. Evilish-just-ask-them mad scientist whose plans to steal the moon are derailed by three orphan girls who decide to adopt him as a potential father. Hey, every evil overlord needs a protégé or three. In addition to Carell, Despicable Me has assembled a strong voice cast, including Jason Segel, Russell Brand, Julie Andrews, Will Arnett, Kristen Wiig and Miranda Cosgrove. Its two biggest selling points, though, are likely being in 3D, and the Minions, a group of yellow South Parky/Toy Story alieny looking things, who do a lot of the heavy lifting for comedy in the ads for the film. The idea of turning the bad guy into the good guy isn’t that revolutionary in film, but is relatively unique as far as kids’ animated movies go. It’s also a tailor-made premise to convince adults that it’s worthwhile buying a ticket to accompany their little ones. It certainly doesn’t hurt that it’s been getting some of the best reviews of the year, rivaling How To Train Your Dragon’s reception, and getting within respectable talking distance of Toy Story 3. The question then becomes, what constitutes a hit? Toy Story or some of the earlier Shrek films seem out of the question, as it’s giving off a low-key vibe, but some other films look like good comparisons. How to Train Your Dragon started slow, in the mid-40s, but has become one of the biggest hits of the year, with over $200 million in the bank domestically. Last spring’s Monsters vs. Aliens started larger, at close to $60 million, but finished lower, just shy of $200 million. Somewhere in between those two starting figures seems likely, as we’re starting to hit a real plateau in 3D as an enticement into theaters (who had “under a year” in the pool for Hollywood killing the goose that lays the golden eggs?). 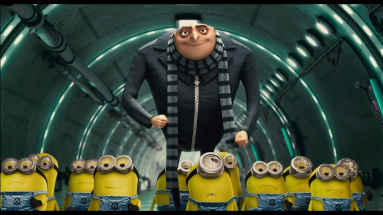 Look for an even $50 million for Despicable Me in its opening weekend. An old classic action film gets a reboot for the second film of the weekend, in Predators. The third film in this series (discounting the crap Alien vs. Predator stuff) takes the action to the Predators’ home planet, with a group of Earth’s biggest badasses (and Topher Grace) brought along to hunt. Adrien Brody, Laurence Fishburne, Danny Trejo, Walt Goggins and Alice Braga make up the rest of the (actual) killers acting as both predator and prey.